Diffusion Beading of Materials is an attempt to pool the experience in vacuum diffusion bonding accumulated by a number of mechanical engineering works, research establishments, and colleges. The book discusses the principal bonding variables and recommended procedures for diffusion bonding in vacuum; the equipment for diffusion bonding and production rate; and the mechanization and automation of equipment. The text also describes the diffusion bonding of steels; the bonding of cast iron and cast iron to steel; and the bonding of dissimilar metals and alloys. The bonding of refractory and active metals and their alloys; the bonding of high-temperature alloys, nickel and nickel alloys; and the bonding of cemented carbides and of a cemented carbide to steel are also considered. 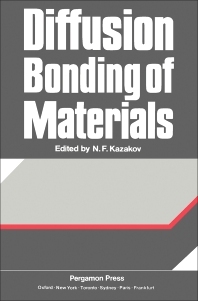 The book further tackles the repair and reconditioning by diffusion bonding; the bonding of porous materials; and diffusion metallurgy. The text also encompasses nonmetals and their joining to metals; quality control of diffusion-bonded joints; accident prevention; and cleanliness in vacuum diffusion bonding.